A convoy traveling near Tikrit convoy flies the flag of Kata’ib Sayyed al Shuhada, an Iranian-backed Shiite militia. Iranian-backed Shiite militias and Iraqi security forces have taken control of key towns outside of Tikrit and are preparing to attempt to seize the central Iraqi city that has been under the control of the Islamic State since June of 2014. The Shiite militias, which are directed by Iran’s Qods Force, have led the fight to regain control of Tikrit. Over the weekend, the Islamic State lost control of Al Dor and Al Awja, two towns south of Tikrit, and Abu Ajil, a town to the east on the opposite side of the Tigris River. Over the past 24 hours, Iraqi forces and the militias have entered Al Alam, a town northeast of the city. The Iraqi military claimed it “liberated” Al Alam yesterday, according to Al Shorfa, however the town is still contested, Reuters reported today. The Shiite militias, which are said to make up two-thirds of the 30,000 troops involved in the Tikrit offensive, have dominated the fighting. These militias are operating under the aegis of the Popular Mobilization Committee, or Hashid Shaabi, which was created by former Prime Minister Nouri al Maliki to combat the Islamic State after the Iraqi military collapsed during the summer of 2014. In addition to leading the Popular Mobilization Committee, Muhandis is also said to direct the operations of Kata’ib Imam Ali (Imam Ali Brigade) as well as command the Hezbollah Brigades, two Iranian-backed militias that are involved in the fighting in Tikrit. Shebl al Zaidi, a former commander in the Mahdi Army who has been photographed with Soleimani in the past, is the secretary-general of the Imam Ali Brigade, which is operating from Camp Speicher, a sprawling military base northwest of the city. Other Shiite militias involved in the fighting include the Kata’ib Hezbollah (Hezbollah Brigades), Asiab al Haq (League of the Righteous), Saraya Khorasani (Khorasan Brigades), and Kata’ib Sayyed al Shuhada (Battalion of Sayyed’s Martyrs). All of these militias receive support from Iran’s Qods Force. Hezbollah Brigades, which has been spotted in Al Alam, was designated by the US State Department as a terrorist organization in July 2009. In that designation, State described the militia as “a radical Shia Islamist group with an anti-Western establishment and jihadist ideology that has conducted attacks against Iraqi, US, and Coalition targets in Iraq.” State also reported that the militia receives funding, training, logistics, guidance, and material support from Qods Force. In addition to the Shiite militias, Iranian artillery forces as well as drones are directly supporting the Tikrit offensive, US officials have told The Wall Street Journal. Iran’s heavy involvement in the fight for Tikrit has led the US military with withhold air support. The influence of Soleimani and Qods Force in the latest offensive to retake Tikrit is apparent. Three previous attempts that were hastily launched by the Iraqi government and led by the Iraqi Army in the summer of 2014 failed. During one attempt in July, several Iraqi helicopters were shot down as they dropped off troops north of the city. In another attempt in August, Iraqi forces and Shiite militias rushed into the heart of the city but were ambushed and forced to withdraw. The current offensive appears to be better planned than previous attempts to regain control of Tikrit. 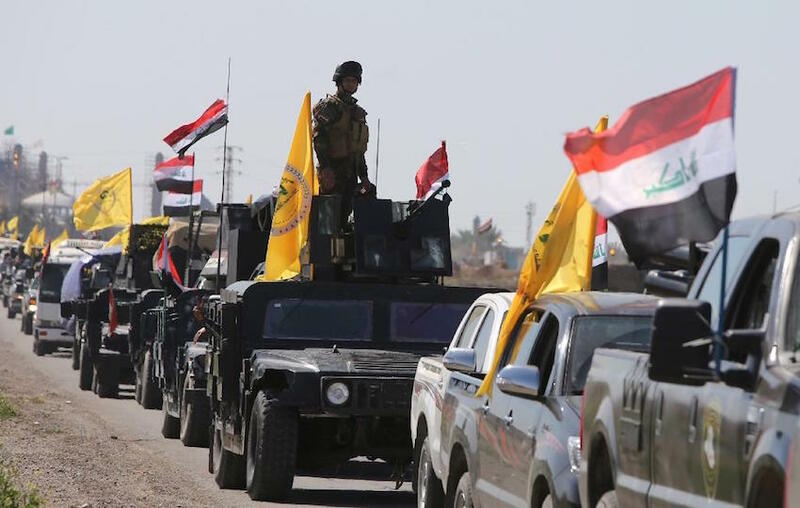 The militias and Iraqi forces are preparing the battlefield by securing supply lines southward to Samarra and gaining control of surrounding towns and villages before attempting to enter the city. But victory for the Iranian-backed force is by no means assured. The military and militias have yet to wrest a major city from control of the Islamic State. Iraqi forces attempted to retake Baiji in December 2014 and succeeded in doing so for several days, but its troops ultimately abandoned the city after an Islamic State counteroffensive. If the Islamic State decides to make a stand in Tikrit, casualties are assured to be heavy. During the Second Battle of Fallujah, in November 2004, it took more than 11,500 US Marines, soldiers and seamen and British troops, and 2,000 Iraqi troops to defeat entrenched al Qaeda in Iraq and allied fighters. Ninety-five American, four British, and eight Iraqi troops were killed killed during the assault. Al Qaeda in Iraq is estimated to have lost up to 1,500 fighters during the battle. A fight to the death for Tikrit, in which neither side will follow US-established rules of engagement, will be costly for both. The Shi’a Crescent, one step at a time. Unfortunately for them, the crescent ends at Israel. How is it that the Iraqi Army is still being reconstructed, yet these Shiite militias seem to have been built up fairly effectively over the last few months, and are combat effective? What is the disconnect? These militias generally trace back to the 2003-and-before Badr and Sadr militias — Iranian surrogates, then as now. While the Iraqi Army is having to re-invent itself, these Qods Force-supported militias benefit from 10-plus-year-old operating networks inside the country. While this or that Shia militia unit might be newly-formed, its cadre is likely a band of hardened fighters, experienced in working together. How does a contradictory estimate of force strength from a the Kurds make an estimate from US Intelligence less valid? You could posit that the Kurds would like to liberally estimate the number to make themselves look and feel better about their victories. Near Al Asad, an airstrike struck an ISIL tactical unit and destroyed two ISIL vehicles. Near Al Qaim, an airstrike struck an ISIL staging area. Near Fallujah, three airstrikes struck an ISIL large tactical unit, two ISIL tactical units and destroyed an ISIL vehicle. Near Kirkuk, five airstrikes struck an ISIL tactical units and destroyed five ISIL excavators, three ISIL vehicles and an ISIL VBIED. Near Mosul, an airstrike struck an ISIL tactical unit and destroyed four ISIL armored vehicles. Near Ramadi, an airstrike struck an ISIL tactical unit and destroyed an ISIL fighting position. Near Sinjar, an airstrike struck an ISIL large tactical unit and destroyed three ISIL buildings and an ISIL vehicle. CENTCOM not so long ago provided an ISIS/ISIL KIA number. If one was to juxtapose the FUMBLELINA’s in the US Intelligence Community of ISIS/ISIL KIA’d against their estimation of their projected strength its not only laughable its insulting. The fact that the Iraqi Army is not cutting and running is significant. They obviously have good leadership in place, Iranian or otherwise. They have Tikrit surrounded. Let the siege begin! It also helps that the Kurds are battling ISIS near Kirkuk and Sinjar and north of Mosul; plus, the Syrian Kurds are hammering ISIS in Northern Syria: these Kurdish actions, along with coalition airstrikes hammering ISIS in Iraq and Syria, really helps the Tikrit operation. Success looks promising. Best of luck to them. Thats because they are two different philosophies about war machines. The us/european model relies on significant training with sophisticated integratedequipment (armor, artillery, close air support, etc) as force multipliers,while the Iranian model is limited training with heavily equipped infantry (crew served weapons, rpg’s, mortars, 107mm/122mm/130mm rocket & artillery platforms: low tech but lethal and easily mastered. I call the later “small ball””, and the Iranians are very good at it. The fatal flaw with the West’s Iraq program was thinking that an arab army could master western war tactics and strategy along with their sophisticated and expensive equipment. I’m happy to see progress being made. As of today, the Militia and ISF have taken large parts of Tikrit. They’ve stalled some what in attempts to take the southern parts of the city because of snipers and roadside bombs. Things will probably slow down here on out, but overwhelming force will decide the issue pretty quickly. Tactically things seem to be going pretty well for most of the Iraq, Shia, and Kurd forces inside Iraq. Isis is fracturing in so many ways in Iraq. Infighting, targeting by rogues forces inside controlled areas, airstrikes, etc. A lot can be learned from this when it’s all over. Here’s hoping the right lessons are learned. 75% of Tikrit is now in the hands of government forces. Basically 150 gunman vs 23,000 ISF and Militia forces. Few more days and it’ll be wrapped up. It also seems the success, thus far, is causing a step up in operations in Anbar. US and Allied fighters hit mulitple targets today in the province. Looks like focus is now shifted to wrapping up the Iraq part of this thing quicker that was originally expected. Word is that Fallujah is next. Iran has plenty of *relatively* modern war equipment and the arab armies of egypt and jordan execute western tactics effectively enough that has nothing to do with it. Iraqs army suffers the same problems as every other arab army. The country is not ethnically cohesive and very tribal. this completely destroys military cohesion, and national cohesion for that matter. The entire region is screwed up from how it was divided up after world war 1. Thats why they lose all their wars. These militaies are of a certain religious / ethnic makeup, thats why they can be formed much faster then the general army and why they are relatively effective in such a short time. It also spells major trouble for the future that they are being used. The world is a complicated place and their are reasons for everything. “arabs not being able to use our weapons! !” is nothing more then racial first world arrogence. Just be happy you won the lottery when you are born.